What’s behind the ground-breaking 3D habitat map of the Great Barrier Reef? International aquatic remote sensing company EOMAP will showcase its unique contribution to the world-first 3D habitat map of the Great Barrier Reef (GBR) at the International Forum on Satellite-Derived Bathymetry, SDB Day 2019, next month in Australia. The mapping project, ‘3D live habitats for the full extent of the Great Barrier Reef’, will provide, for the first time, maps of the predicted coral types and underwater landscape for the more than 3,000 reefs within the 350,000 km2 of the GBR. EOMAP’s cutting edge technology provides essential data for this revolutionary project, in which the University of Queensland (UQ), Great Barrier Reef Marine Park Authority, and the Australian Institute of Marine Science are partners. The resulting maps will be at an un-precented 10m horizontal grid resolution and reveal bathymetry (water depth), geomorphic zonations and bottom types, in addition to the predicted coral types. “No maps exist to date that provide so much detail for every single reef,” says project leader, Dr. Chris Roelfsema from the Remote Sensing Research Centre at UQ. The ambitious scope of this undertaking was made possible by recent advances in satellite-mapping technologies, environmental modelling and image classification methods. Using the European Space Agency Sentinel-2 platform satellite imagery, EOMAP applies its industry leading, proprietary technology to retrieve satellite-derived bathymetry (SDB) and sub-surface reflectance (SSR). The result of the SDB mapping is a 3D elevation model of the seafloor—one of the cornerstone data layers for the entire project. “Accurately mapping bathymetry using satellite imagery requires very sophisticated, physics-based algorithms,” explains Dr. Magnus Wettle, Managing Director of EOMAP Australia. Both the SDB and the SSR data are fundamental to the overall project. The SDB not only directly guides the geomorphology classification but is also used for environmental modelling input to calculate wave energy environments across the GBR. The wave energy parameter in turn informs all reef habitat classification and predicted coral types. The SSR data provides marine ecologists with additional, important information, when revealing the theoretical seafloor colour for the final habitat classification. Recent advances in machine learning and semi-automated classification then enable the researchers to efficiently and accurately process and classify all the reefs of the GBR. “We are extremely pleased to be working alongside our project partners in helping to enable more effective monitoring and management of the global biodiversity icon that is the Great Barrier Reef,” concludes Dr. Wettle. The latest progress on this project will be presented at SDB Day 2019, which Australia is hosting on the Sunshine Coast, 14–16 May. 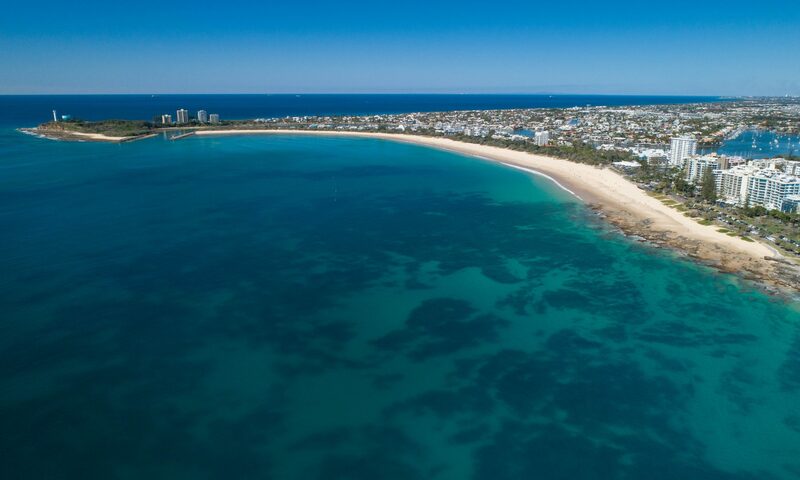 Munich, Germany – 13 December – EOMAP is very pleased to announce SDB Day 2019, an international Satellite-Derived Bathymetry Technology and User Forum, set to take place on the beautiful Sunshine Coast of Queensland in Australia on May 14-16, 2019. (Satellite-derived Bathymetry (SDB)) has experienced accelerating uptake in recent years, with users from industry, government and academia using this cost-effective and reliable method for multi-disciplinary hydrographic seabed mapping projects, hydrodynamic modelling, reconnaissance surveys and environmental campaigns across the globe. As SDB is now being considered as an established survey technology, it is increasingly important that users, researchers and providers worldwide have a venue for meeting as well as exchanging information on current and future capabilities or requirements. 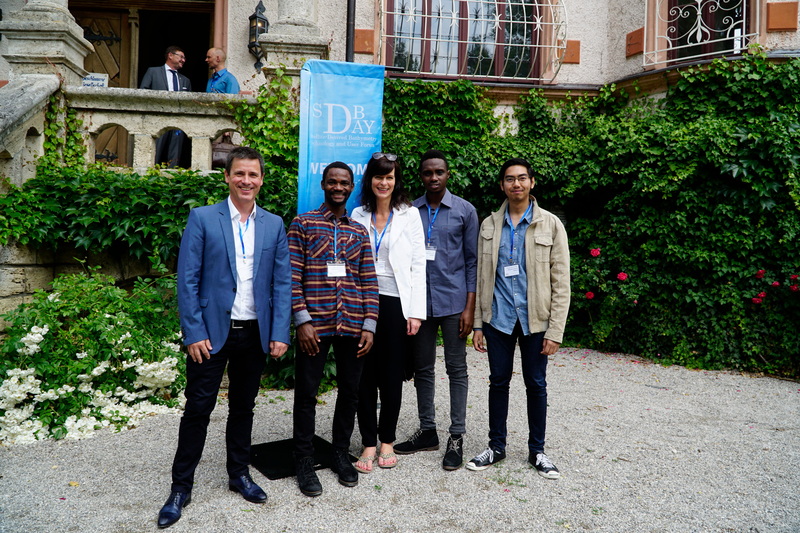 The inaugural SDB Day 2018 took place in the Lake District of Bavaria, Germany, and offered a unique opportunity for users and providers to discuss capabilities, data integration, requirements and quality standards. The conference will host again international speakers, panelists and participants from North America, Europe, Middle East and Asia. SDB Day 2019 is organized and co-sponsored by EOMAP, leading provider of SDB and coastal mapping services. For more information, and to reserve your spot (numbers are limited), please visit the conference website on www.sdbday.org. 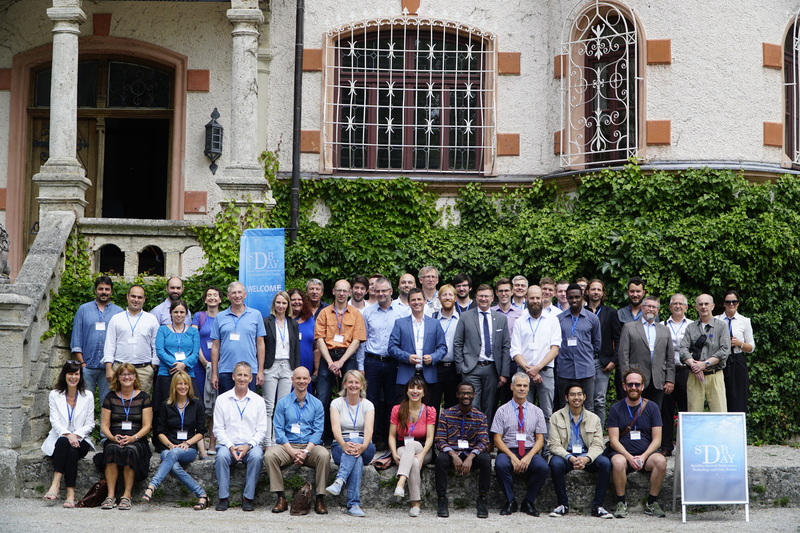 Munich, 13 June 2018 – With over 45 delegates from more than 15 countries around the world, the first international Satellite-Derived Bathymetry Day (SDB Day) organized by EOMAP was a great success. 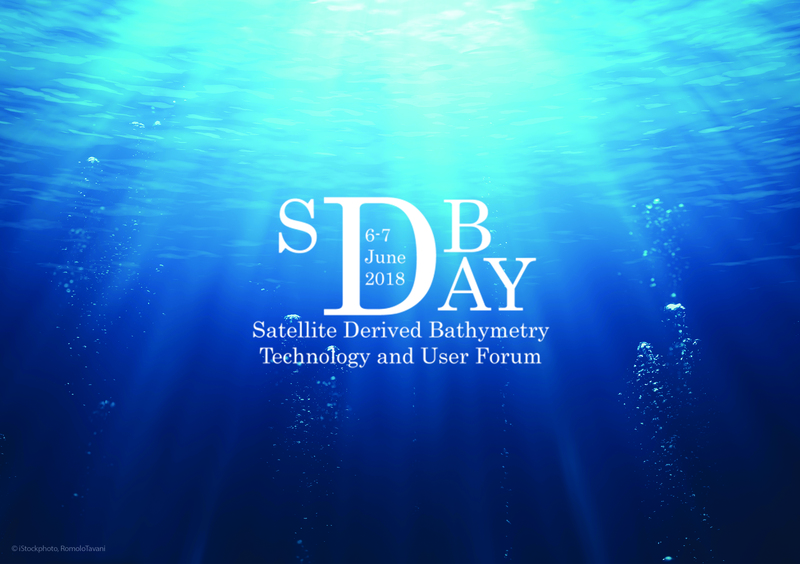 For the first time all relevant players came together on 6 & 7 June 2018 to anticipate what was to come for the Satellite-Derived Bathymetry (SDB) technology in the next years and revealed future opportunities for providers and users. As a result and initiated by the participants, first steps were taken to form a Satellite-Derived Bathymetry Working Group. The next SDB Day will be announced shortly. Initially established as a reconnaissance tool for shallow water bathymetry only, cutting-edge SDB techniques are increasingly used as a cost-efficient and rapid survey method for acquiring high-resolution bathymetric data down to water depths of 30 meters. More information about the conference is available at www.sdbday.org. 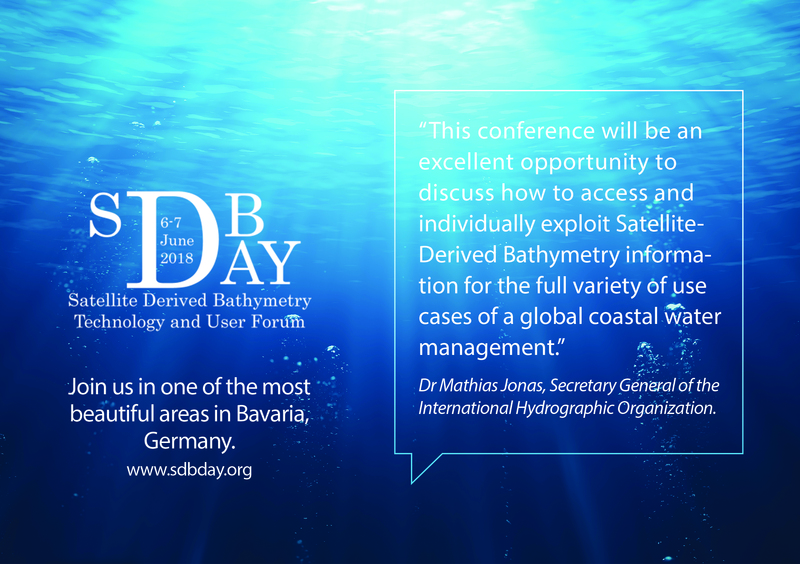 Munich, Germany – 27 April 2018 – The first international conference on Satellite-Derived Bathymetry (SDB Day 2018) is now open for registration to discuss key issues on capabilities, data integration and quality standards. The Satellite-Derived Bathymetry Technology and User Forum will be held on June 6 and 7, 2018 in the Bavarian Lake District near Munich, Germany. According to the statistics maintained by the International Hydrographic Organization, over 50 percent of the world’s coastal waters have never been surveyed. However, there are many users who require current high-quality bathymetric information for this zone, highlighting the need to fill this data gap. The Satellite-Derived Bathymetry (SDB) technology helps to address this challenge. Initially established as a reconnaissance tool for shallow water bathymetry only, cutting-edge SDB techniques are increasingly used as a cost-efficient and rapid survey method for acquiring high-resolution bathymetric data down to water depths of 30 meters. The use of this technology in applications such as safety of navigation, reconnaissance surveys, coastal zone management and hydrodynamic modeling is increasing significantly, and there is therefore a compelling need to discuss current technological capabilities, application requirements and suitable quality standards of SDB data. The conference will host international speakers, panelists and participants from North America, Europe, Middle East and Asia. Topics will include quality assurance and uncertainties, integration and use concepts, standards and capacity building. “We are excited and proud to be hosting this event as it will create a unique opportunity for a broad spectrum of SDB stakeholders. The level of response we have received so far demonstrates that SDB is now considered an established shallow water surveying and mapping tool, alongside more traditional methodologies”, says Dr. Magnus Wettle, Managing Director of EOMAP Australia. EOMAP, one of the sponsors, is organizing the conference. Media partners are Hydro International, Eco Magazine and GeoConnexion. For more information and to register for the conference, please visit www.sdbday.org.